Atomic Skin™ announces their new line of heated gear due to hit local dealerships in the spring of 2015. "To launch our new product line our engineers have always kept the rider first and foremost in their mind. Remember there isn't bad weather just bad clothing. " Warren, Michigan — Dec 05, 2014 — Coliant Corporation and Atomic Skin, Inc. announces their new line of heated gear due to hit local dealerships in the spring of 2015. Atomic Skin is engineered to extend the riding season while providing the comfort and added safety experienced when riding in warmer weather. Heated gear is not a new concept to any rider, Atomic Skin incorporates revolutionary new design concepts utilizing Carbon Nano-Core heating elements. The flexible Atomic Skin Carbon Nano-Core elements conduct warmth to the body by emitting far infrared (FIR) wave length technology. This provides a more comfortable, even flow of heat encompassing the body compared to other heating technologies resulting in a more comfortable and enjoyable experience. Set up of the Atomic Skin water and dust proof, wireless remote "line-of-sight" controller takes only a couple minutes. Riders who purchase a full set of gear (jacket, gloves, pants and socks), have the option of controlling warmth to the upper part, the lower part or both zones of the body to address personal preference. Atomic Skin is also the only heated gear on the market today that can control up to four items of clothing at a time. Atomic Skin has a downloadable Android phone application to control the temperature of the gear and provide real-time diagnostics. An application for the iPhone is planned for the fall of 2015. 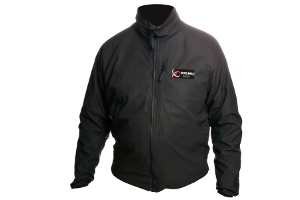 The Atomic Skin outer shell is constructed of a durable, weather resistant, polyester blend fabric. The Pro-form stretch panels permit a more comfortable form fit to the entire body. Additional features include a convenient breast pocket for storing personal items and a rear storage pouch that allows the jacket to fold into itself for compact storage. The remote control features a rechargeable battery and all cabling is included permitting an on the fly Powerlet™ charging system.